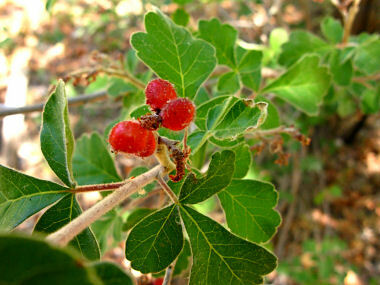 Skunkbush is a member of the Cashew or Sumac Family. It is a shrub that can grow to 10 feet in height. Leaves are dark green and composed of 3 lobed leaflets which grows to 1.25 inches in length. 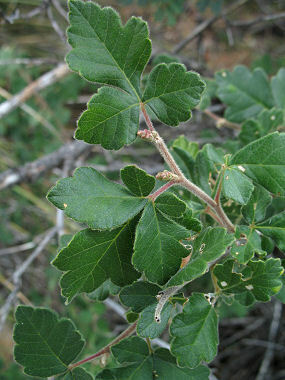 The plant grows in canyons, ravines and disturbed areas at elevations between 3000-8000 feet. Skunkbush gets its name from the fact that the leaves emit a strong odor when crushed. Skunkbush blooms between March and June and produces yellow flowers to 0.75 inches in width that grow in dense clusters on a spike. Flowers are followed by a cluster of sticky, bright orange-red berries. In the fall, the abundant red berries of the Skunkbush were gathered by Indians, dried, ground and mixed with water and sugar to make jam.